Every year, on the 11th day of September, at 12:00.01 a.m., this space goes dark. Dark in the sense of darkened memory. Dark in the sense of lost hopes and dreams. Dark in the sense of innocence surrendered forever. Dark because our hearts are filled with anger and pain. Dark because our eyes are filled with tears. Dark, now, for the 14th year in a row. Dark, in memory of that fateful Tuesday that we now call, simply, 9/11. Do you remember that day? I do. I always will. • At 8:46 a.m., 14 years ago today, American Airlines Flight 11 out of Boston, Massachusetts, crashed into the north tower of the World Trade Center. • At 9:03 a.m., 14 years ago today, United Airlines Flight 175 from Boston crashed into the south tower of the World Trade Center and exploded. Both buildings were burning. • At 9:37 a.m., 14 years ago today, American Airlines Flight 77 out of Washington Dulles, crashed into the western side of the Pentagon and exploded. All on board and 125 in the Pentagon were killed. • At 9:59 a.m., 14 years ago today, the south tower of the World Trade Center collapsed, crashing into the streets below. • At 10:03 a.m., 14 years ago today, United Airlines Flight 93 was crashed by its hijackers into a field in Pennsylvania after the passengers made a desperate attempt to retake the aircraft. All on board died. • At 10:29 a.m., 14 years ago today, the World Trade Center’s north tower collapsed from the top down. A cloud of ash turned day to night in the narrow streets of lower Manhattan. Nearly three thousand lives ended that day, 14 years ago today. Men. Women. Children. The oldest was 85. The youngest was two. They died in an instant, vaporized by fireballs. They died long agonizing terrifying minutes later, trapped in the smoke and the flames. They died jumping from the upper floors of the Twin Towers. They died in the Pentagon. They died in a field in Pennsylvania. I remember it all. It might as well have happened yesterday. But it was 14 years ago. Fourteen years. Fourteen years. And my heart is still full of anger and pain. My eyes are still full of tears. It is hard, so hard, to get through this day of remembrance, every year, on 9/11. We who survived can’t help but weep on this terrible day. For everything we lost. For everything that should have been. For all those whose lives were lost. For all who remained behind, broken and bereft. 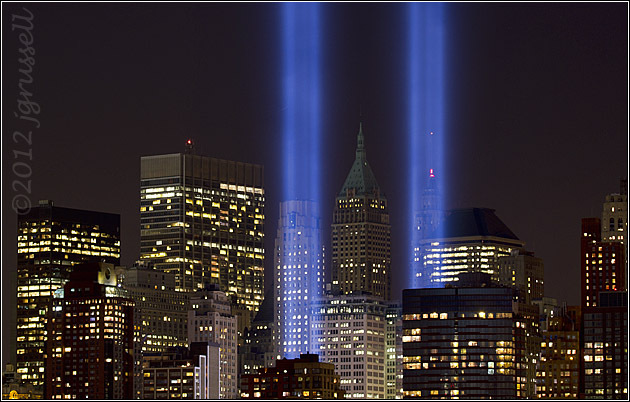 Yet I must do what I swore I would do, 14 years ago, as I walked with my friend Toni through the streets of lower Manhattan, and stared at the posters with the faces of the missing, and at the empty firehouses, and at the twisted steel girders. I promised that I would remember. It is time now to fulfill that promise for this year. It is time again to remember. It is time again to open the film cannister into which I brushed some of the dust of Ground Zero, time again to touch that dust with my own hands, and time again to stand witness. To make sure that I do not forget. That we do not forget. That no-one forgets. That all those lives will never be forgotten. To say, one more time, this year and every year,1 as long as I have life and breath, in words and images, NEVER FORGET. Once again, you had me at Never Forget. The tears always flow when I read your 9/11 post. NEVER FORGET! So well said Judy. Thank you. I was at Dulles that morning, flying out of the same concourse as the hijacked flight, on a 757, their aircraft of choice. That day–and the ensuing weeks–were undoubtedly The worst in my life. I live on the West Coast, and I remember being awakened by a phone call that morning from a friend who lives on the East Coast, who was watching the broadcasts. She told me she was calling everyone she loved, because no one knew, then, what the attacks were a precursor to. I’ll never forget. My sister’s son lives in Manhattan. When she heard, she tried to call him, and got no answer. She panicked, as any mother would. Then he came up out of the subway in midtown Manhattan, and noticed which direction everyone was looking. He turned around just in time to watch the second tower fall. He called his mother immediately to tell her he was all right. A few of his friends died. He lived then inside the zone that was cut off for days, so stayed with friends, and moved further north. He’ll never forget, either. >> None of us should. Not for one moment. Not ever. Judy, This was so emotional.I was getting ready to go visit Jim Thorpe, PA with my sister Barbara and her husband, when the TV started showing the first tower on fire. I remember watching the second plane crashing into the tower. It was just too horrifying! It is etched in my brain, and brings tears to my eyes in the memory. Your tribute was beautiful and tear-jerking. We will always remember. It’s one of those days we will surely never forget, Ruth. My sister-in-law’s cousin wrote the following poem a few days afterwards. Sharon welcomes people to share this, as long as her information is kept with it. We surely all share her tears today. 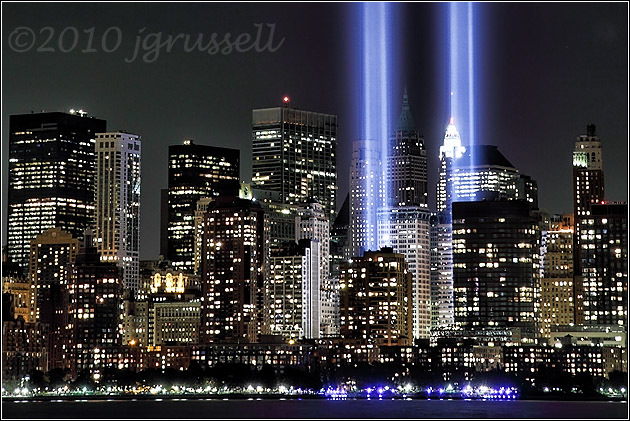 such a maelstrom of emotions…as raw today as they were then…only thing to say is…NEVER, EVER FORGET!!! Thanks Judy. That’s about all any of us can say, isn’t it? Perfectly said. I can’t say more. There are a lot of unanswered questions just like that young woman’s questions, aren’t there?